This article WILL NOT EXPLAIN HOW TO OPEN OR OBTAIN A LISENCE, JUST Terminologies you might need to know before hand. Vision: is the highest point of the triangle, it is the statement that defines what the organization wishes to see in the future ( the big picture of what is to be achieved). It should be clear and comprehensive mental picture of what the organization should/want to be sometime in the future. It describes the organization direction and what it should be. Identifies the areas where you need to improve to achieve. Values: are the qualities or traits that represent the highest priorities ( the driving force) and supports the vision. It defines and describes the way people within the organization should behave, think or act. It’s the fundamental values the organization individuals should base their actions on. Its the organization’s principles, beliefs, and philosophy. Google’s Mission is to organize the world’s information and make it universally accessible and useful for everyone. Goals are an expected or desired outcome of a planning process. Goals are usually broad, general expressions of the guiding principles and aspirations of a community. Objectives are precise targets that are necessary to achieve goals. They are detailed statements of quantitatively or qualitatively measurable results the plan hopes to accomplish. 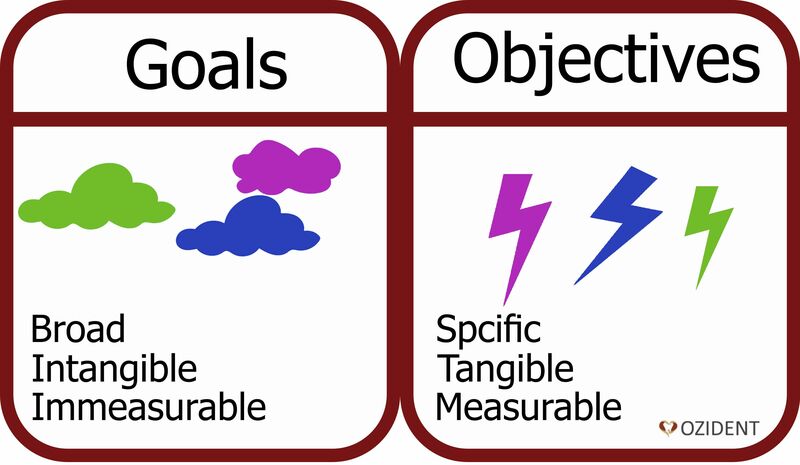 The difference between goals and objectives is that a goal is a description of a destination, and an objective is a measure of the progress that is needed to get to the destination. 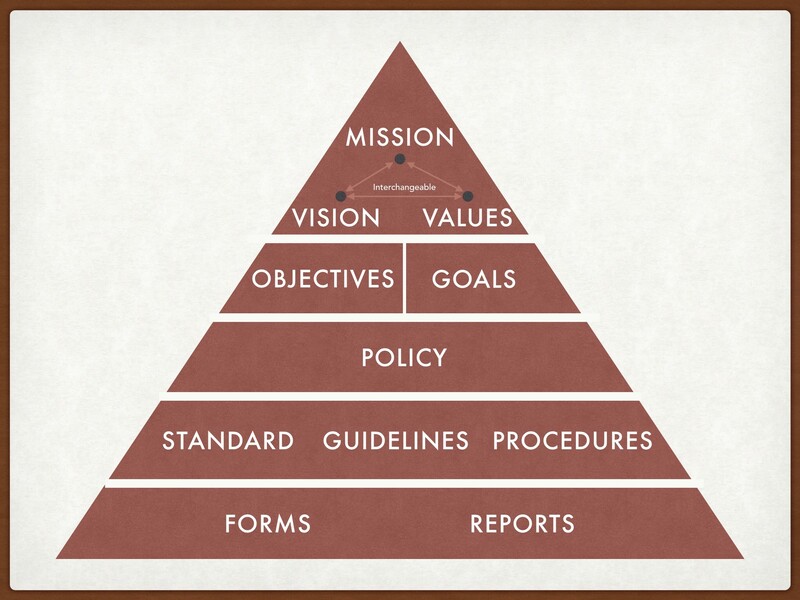 Policies are Formal, brief, long-term, high-level management (produced and supported by senior management) that embraces the organization’s general vision, values, and mission. They are instructions and drive on how the organization is to be run. They reflect an organization’s goals, objectives, culture for the broad audiences. They are further defined by standards and guidelines. They are mandatory and are applicable to anyone (employee, contractor & temporary). If they are not gonna be followed, they require an exception and it that exception should be documented. They ensure discipline and compliance (mandatory) which fails to comply will result in disciplinary action. They are created with the intent to be in place for the long-term with regular reviews for possible improvements as needed. Are mid-level mandatory actions or rules to ensure uniform application of a policy and compliance is mandatory. Standards can be directed to a broad audience or limited to specific groups or individuals. Like policies, standards are mandatory and Compulsory and must be enforced to be effective. Special approval is required if the standard will not be followed. Guidelines ( best practices ) are intended to be advice & recommendations on to how to maintain the policy in the absence of a standard. The purpose is to help make decisions about intended goals (should do), beneficial alternatives (could do), and actions that would not create problems (won’t hurt). They are designed to streamline certain processes according to what the best practices are. Guidelines are recommendations and advice in a given situation ( Non-mandatory) to an organization when specific standards do not apply. Guidelines can be used to create a new standard or Procedures. “guidelines” and “best practice” are interchangeable. Procedures are specific step-by-step instructions (ordered tasks) for performing some function or achieve a given goal. They describe the process: who does what, when they do it, and under what criteria. Procedures define “how” to enforce a policy. They can be text-based or outlined in a process map. 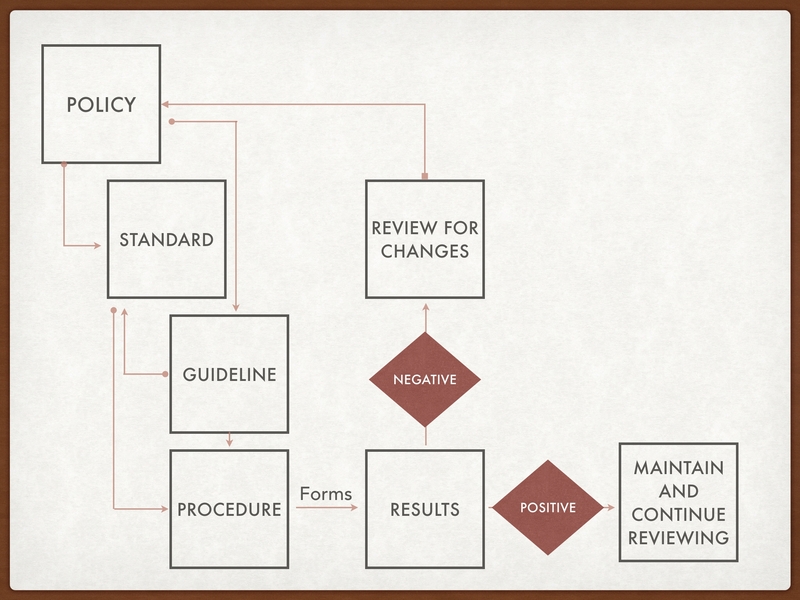 Procedures are often called the “cookbook” for staff to consult to accomplish a repeatable process. They Are abbreviated as S.O.P or Standard Operating Procedures. A series of detailed steps by step instructions to implement and accomplish an end goal. They are detailed enough and yet not too difficult that only a small group (or a single person) will understand. The procedures provide a quick reference in times of crisis. Work Instructions: Describe how to accomplish a specific job. Visual aids, various forms of job aids, or specific assembly instructions are examples of work instructions. Work instructions are specific. You may include work instructions in a procedure, or simply refer to them in the procedure. Work instructions usually include the same elements as the procedures and are similar in structure. The difference is that the work instructions are more detailed, covering activities that must be done, the steps to take and in what order, what tools and methods should be used, and accuracy requirements. To sum it up, you will need to provide proof that your activities and processes are done in the manner that is specified in the procedures and the work instructions. This is where records and forms come into play. They are the objective evidence that provides tangible proof that the procedures are following the guidelines thus adhering to the policy thus achieving the mission and on the right track towards the vision. This can be done by creating forms and records. Forms: Forms are documentation that is used to create records, checklists, surveys, or other documentation. They Help provide feedback regarding the procedures. Records are a critical output of any procedure or work instruction and form the basis of process audit which will help in process improvement initiatives.